This release comes as the U.S. Department of Education and industry insiders currently deciding  which states to award half a billion dollar in grants designed to bolster the school privatization industry under the federal Charter Schools Program (CSP). For example, in the 2011-2012 school year, charter school students ran two and half times the risk of having their education disrupted by a school closing and suffering academic setbacks as a result of closure. Dislocated students are less likely to graduate. In 2014 study , Matthew F. Larsen with the Department of Economics at Tulane University looked at high school closures in Milwaukee, almost all of which were charter schools, and he concluded that closures decreased "high school graduation rates by nearly 10%." He found that the effects persist "even if the students attends a better quality school after closure." Hidden behind the statistics are the social consequences. According to 2013 paper  by Robert Scott and Miguel Saucedo at the University of Illinois, school closures "have exacerbated inter-neighborhood tensions among Chicago youth in recent years" and have been a contributing factor to the high rate of youth incarceration. 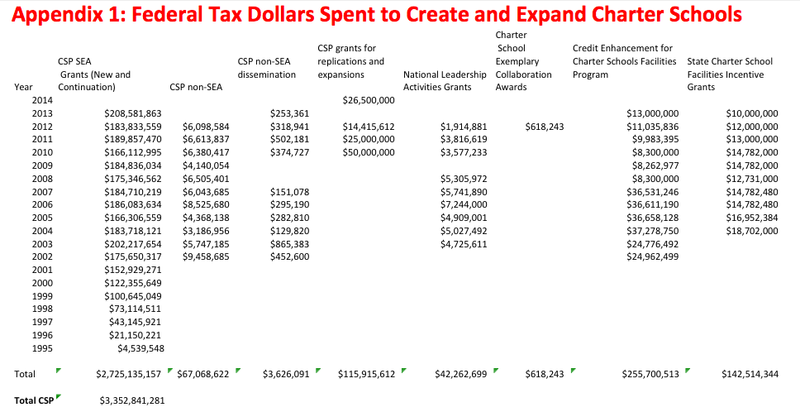 As CMD has calculated, the federal government has spent more than $3.3 billion  in the past two-plus decades fueling the charter school industry that has taken money away from traditional public schools. And, as the Center for Popular Democracy has demonstrated, more than $200 million of that money resulted in fraud and waste over the past decade. Click here  for the full state-by-state list of charter schools that have closed between 2000 and 2013.